When you enter this charming Costa Rica vacation flat, your gaze will be taken by the sight: the whole town of Las Catalinas and just beyond, blue as can be, imposing lies the sea, open to you in a 180º panoramic view through the floor to ceiling windows of its sliding doors. Whether you look at it from its ample balcony or any point of its spacious living room, this Guanacaste vacation rental is a must for those drawn in by the ocean. 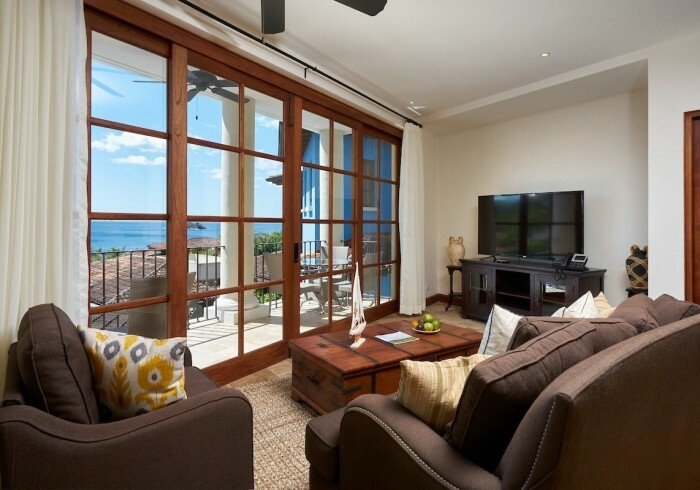 White columns give the balcony a sense of grandeur, but the majestic Pacific is what gives this beach flat in Las Catalinas its particular identity. Inside, next to the cozy sofas, dining table, and modern kitchen, you’ll find rich wood furniture aplenty and shades of pirate tales, with a colonial-style cabinet and a coffee table that recalls a treasure chest. While the bounty is in the views, this Costa Rica beach apartment offers plenty of comfort to relax during your stay, particularly in its two bedrooms with queen beds, each with an ensuite bathroom. An eclectic mix or art is found throughout this home, with modern abstract and symbolic coexisting with realistic depictions of colonial towns and tropical fruits. With its panoramic ocean views and many areas to enjoy them, overlooking the entire beach town of Las Catalinas yet just a couple of minutes from the beach, this Costa Rica rental home accommodates up to four guests. Children are welcome. Embrace the comfort of a private beach apartment in a picturesque setting and experience the wonders of Costa Rica the way it’s meant to be. Enjoy the privacy and quiet of your own Guanacaste apartment with full daily housekeeping service and let our dedicated concierge team help plan your vacation so that your stay in paradise is a resounding success.